Web Services Add-in for Excel (StrikeIron On Demand) is a simple, easy-to-use, drag-and-drop integration of Web services directly into Microsoft Excel spreadsheets. Access real-time data, on demand by utilizing Web services without any programming knowledge. On Demand Web Services Add-in for Excel removes the technical issues of finding, accessing, understanding and integrating Web services into Excel by taking advantage of the Web Services Add-in for Excel Business Network and powerful underlying 'dynamic invocation' technology that requires no compiling, no programming and no additional software. Real-time integration of critical external and internal data through Web services to improve business decisions. Significantly reduced Excel on-demand application development time and expense. Improved data consistency across your company by maintaining a single source that can only be accessed by Web services using Excel. Increased savings of IT time and cost by providing self-service application development by users instead of supporting specialized data management applications. Improved data security through the 'Invisible Link' option that erases the data upon closing of the workbook to prevent unauthorized viewing. 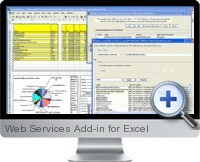 Greater reliability and security by using Web Services Add-in for Excel Premium Web services. Extensible development platform with access to the On Demand API to take advantage of the services provided within the product. Greater productivity with integrated access to the breakthrough Web Services Add-in for Excel Business Network - the largest Web service directory in the world with over 1000 entries and graphical tools and services to make it easier than ever before to understand and use Web services.